Top 10 Firefighter Party Game Ideas! The following firefighter party game ideas were inspired by all the little boys and girls that have ever made the statement “when I grow up I want to be a firefighter”. 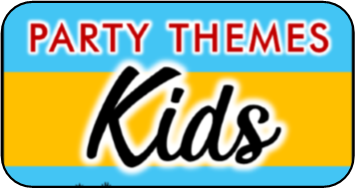 Most kids have, and if your child is crazy about firefighters, fire trucks, sirens, and anything that has to do with the firefighter life then throwing a firefighter birthday party theme will be their dream come true. It doesn’t have to be hard to put together this fantastic theme. The following are some great party game ideas. 1. First they rush to put on a fire hat, rain coat, and big boots. 2. Once they are dressed they must jump in the fire truck (an empty cardboard box decorated like a fire truck and open at the top and bottom) and hold it around them as they run in and out of cones trying to rush to “the fire”. If you do not want to build a fire truck you can have the children push a toy fire truck through the cones. 3. Once they make it through the cones they will see “the fire”. The fire is empty two liter bottles with painted flames on them set up on a table. You can choose one of the following ways for players to put out the flames. Knock them down using a water gun. Knock them down using a water balloons. Hook up garden hose and squirt the flames down. Once the flames are all knocked down the obstacle course is over. Time each player to see who runs through the fastest, or just let each player play for fun or “training”. 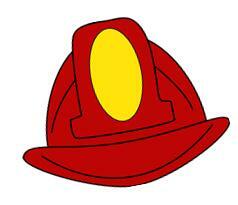 You will need to print out a sheet of fire fighter uniform pieces (hat, coat, boots, etc..) for each player. You can print out the pieces here. Cut each piece out and hide all the pieces in your playing area. 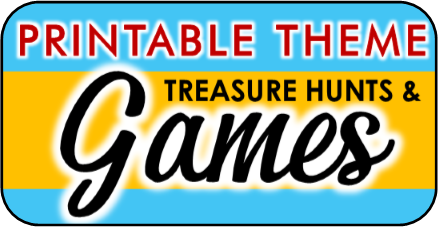 On the start of go each player must rush to find one of everything they need. They cannot pick up doubles. If they find a piece they already have they must leave it where it is. Once they have found all their gear they must rush to get in the fire truck (this can just be any designated area) and sit down. You can award prizes for those who finish first, or you just play for fun as a “firefighter training” game. Have all the children stand in a circle. Each child reaches their hands into the circle and grabs a hold of another child’s hands. They should grab a different child with each hand. Once everyone has a hand they cannot let go. They must work as a team to untangle the knot by twisting, turning, ducking, and stepping over others. This is a fun activity that will have the kids rolling. Start the music and have kids show off their dance moves and boogie. When the music stops all the kids must immediately stop what they are doing, drop to the ground, and start rolling to put out the imaginary fire on their clothes. This is a fun relay race where players work together to transport water to “the fire”. 1. Divide players into two teams. 2. At the start line have a kiddie pool full of water for both teams to share. 3. At the finish line have identical empty buckets/ pitchers awaiting the team. 4. Each team must spread out and create a line between the pool and their team’s pitcher. 5. Each child is given a plastic party cup. 6. On the start of go the player on each team who is closest to the pool must rush to fill up there cup and run it over to pour it into the cup of the next team member cup. 7. This continues until it gets to the last player who then dumps the cup into the team pitcher. 8. As soon as the first player empties their cup they can run back and fill it up again. 9. The first team who completely fills up their pitcher wins! This game is sort of like a human piñata. An fun natured adult must play the part of the fire. They can dress up in orange and red clothes, maybe even hang some streamers off of them, to make them look more the part. The “fire” gets to run around the playing area with a bag of candy or treats. Each time a fire fighter hits them with a water balloon they get rewarded by the fire throwing out another handful of candy. All the players can then rush to collect the candy. Play until the fire is extinguished (all the candy is gone). Another “put out the fire game” I heard of was when a mom used sidewalk chalk to draw flames and fire on their garage door. When they were ready to play the game they brought out a large bucket of water and a pool water shooters (the kind that you fill by sticking in water and pulling back the trigger). They gave a shooter to each child and let them put out the fire by squirting the house until it was clean. They had a blast with this! Create Fire Fighter life nets using hula hoops and material such as small sheets or plastic table clothes. You will need one net for every two players. Have players pair off and grab a net. An adult volunteer must toss down stuffed animals from a second story window or tree. The little fire fighters must try and save the animal by catching it on their nets. This game is fun but it also takes teamwork because the pairs must work together to coordinate their movements. If done right you will have plenty of opportunities to sneak in some safety education during the party. This game teaches children that in case of a fire that the smoke is just as dangerous. They will need to crawl low and go under the smoke. This game requires a black sheet or plastic black tablecloth. Have some volunteers hold the sheets above the ground about one to two feet and billow it up and down. The kids practice crawling low underneath it to make it to the EXIT sign. You can make the sign out of poster board or construction paper. Younger kids LOVE this game.